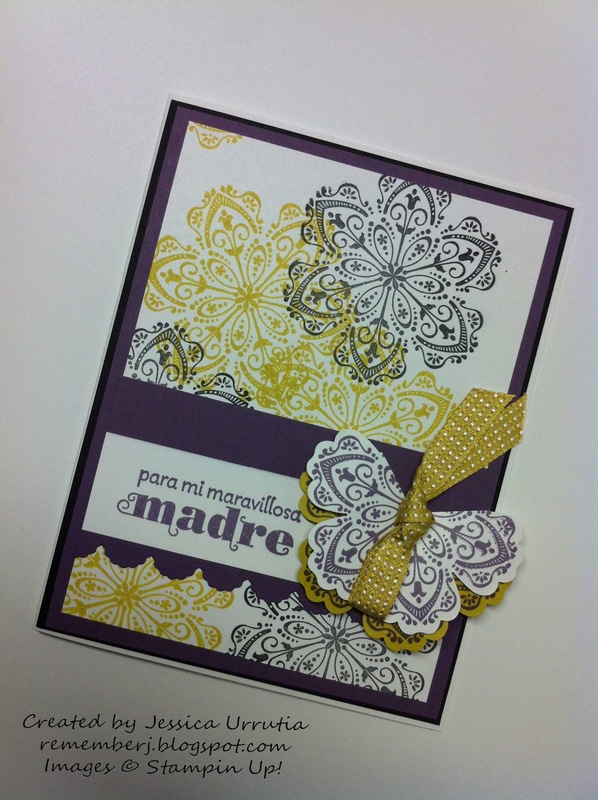 I was looking for pretty ideas for mother's day cards but simple! Yeap...simple is my goal these weeks of May (Mother's day, graduations, weddings, eeek) Simple AND pretty. What do you think of these? 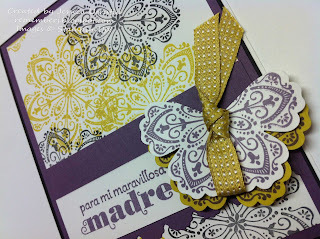 Estuve buscando ideas para mis tarjetitas del dia de madres...bonitas y simples! Sipi...sencillas es mi meta en este mes de mayo (dia de madres, graduaciones, bodas, eeek) Simples y bonitas. Que te parecen estas? To make the butterfly I just cut two top petals from the flower after stamping and punching. I placed one on top of the other with dimentionals and embellished with some knoted ribbon! Para hacer la mariposa solo corte dos petalos de mi flor en la parte de arriba despues de estampar y ponchar. Puse una encima de la otra con dimensionales y la adorne con una cinta con un nudito! I love to create and share with you. 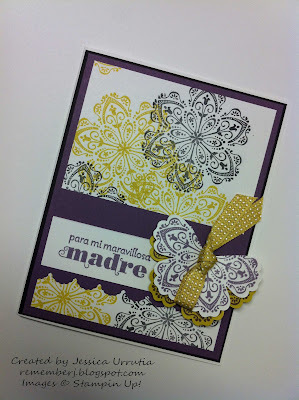 Tomorrow I will share a different card with the same layout, different sets. Don't miss it! Subscribe to my posts thru email on the right side bar! 1. What kind of projects do you enjoy the most? Would like to see more of? Que tipo de proyectos disfrutas hacer mas? Cuales te gustaria ver mas aqui? 2. What are you most drawn to learn? Que te llama mas la atencion? 3. Are you a Big Shot fan? Eres fanaticada de la Big Shot? 4. How do you learn best? Como te gusta aprender mejor? b. Reading picture tutorials easy to print and follow at home / Leyendo tutoriales con foto que puedas imprimir y seguir facilmente. d. Just seeing the project done and getting cues and inspiration from it. / Solo viendo el proyecto y tomando ideitas e inspiracion de eso. 5. What do you like the most about this blog in particular? What stands out for you? Que te gusta mas de este blog en particular? Que te llama mas la atencion? 6. Any suggestions to improve this blog for YOU? Alguna sugerencia para mejorar este blog para TI? ** If you would like to reply ANONYMOUSLY that is fine with me if it makes you feel more comfortable. * Si deseas responder ANONIMO esta bien conmigo, si eso le hace sentir mas comoda. Thank you so much for your responses, every one of your comments blesses me a lot. Muchisimas gracias por sus respuestas, cada uno de sus comentarios me bendice mucho. So pretty Jessica! I love this card and the color combination. I love the quick and easy cards- time is always so precious! I noticed that for the past year you've been making a mix of both intricate and simple cards- I love and appreciate your flexibility! 2. What are you most drawn to learn? I like to learn more about color combos and as easy as this sounds- ribbon tying! 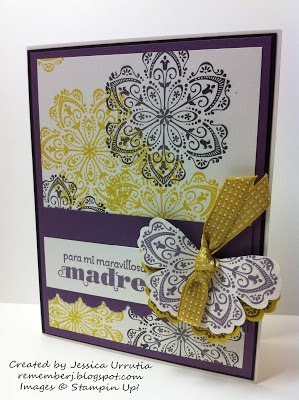 b. Scrapbooking- using MDS to help save time with this would be fantastic! d. Home-decor- using fabric and sewing with cards sounds fun and easy! 4. How do you learn best? reading/written instructions. Oh Jess you are truly inpiring! Thank you thank you for your input. I do take ut seriously and will indeed apply some if not ALL your suggestions. Im truly trying to focus, find my niche and not be all over the place. Simplicity is calling my attention since we r busy mamas trying to keep the joy of learning this art and pass the love of it. Many blessings to youuuuu!! See u tomorrow! !